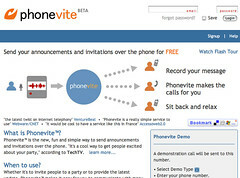 Phonevite is the new, fun and simple way to send announcements and invitations over the phone. I haven’t been able to try it out on account of not having a US or Canadian number under my control and, for the time being, it looks to be only for North America. However I have a lot of time for these concepts. You record your message and then Phonevite does the sending for you. I do like the broadcast perspective. There are times in life when you just want to get the message out, right-away, to everyone. Think, for example, the news of a birth or your wife going into labour. You want to make one recording and whack it out to a predetermined list of people. Or if you want to get a message to each of your work-at-home employees right-away. Anyway check it out at phonevite.com.